The Yoruba People, of whom there are more than twenty-five million, occupy the southwestern corner of Nigeria along the Dahomey border and extends into Dahomey itself. To the east and north the Yoruba culture reaches its approximate limits in the region of the Niger River. However ancestral cultures directly related to the Yoruba once flourished well north of the Niger. Portuguese explorers “discovered” the Yoruba cities and kingdoms in the fifteenth century, but cities such as Ife and Benin, among others, had been standing at their present sites for at least five hundred years before the European arrival. Archeological evidence indicates that a technologically and artistically advanced, proto-Yoruba (Nok), were living somewhat north of the Niger in the first millennium B.C., and they were then already working with iron. Ifa theology states that the creation of humankind arose in the sacred city of Ile Ife where Oduduwa created dry land from water. Much later on an unknown number of Africans migrated from Mecca to Ile Ife. At this point the Eastern Africans and Western Africans synergized. Ife was the first of all Yoruba cities. Oyo and Benin came later and grew and expanded as a consequence of their strategic locations at a time when trading became prosperous. Ife, unlike Benin and Oyo, never developed onto a true kingdom. But though it remained a city-state it had paramount importance to Yoruba’s as the original sacred city and the dispenser of basic religious thought. Until relatively recent times the Yoruba’s did not consider themselves a single people, but rather as citizens of Oyo, Benin, Yagba and other cities, regions or kingdoms. These cities regarded Lagos and Owo, for example, as foreign neighboors, and the Yoruba kingdoms warred not only against the Dahomeans but also against each other. The name Yoruba was applied to all these linguistically and culturally related peoples by their northern neighbors, the Hausas. The old Yoruba cities typically were urban centers with surrounding farmlands that extended outward as much as a dozen miles or more. Both Benin and Oyo are said to have been founded by Ife rulers or descendants of Ife rulers. 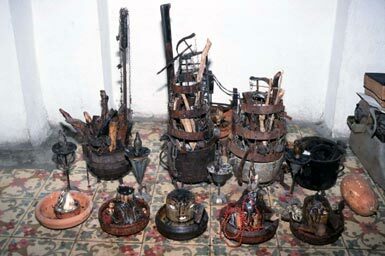 Benin derived its knowledge of brass casting directly from Ife, and the religious system of divining called Ifa spread from Ife not only throughout the Yoruba country but to other West African cultures as well. A common Yoruba belief system dominated the region from the Niger, where it flows in an easterly direction, all the way to the Gulf of Guinea in the south. It is no accident that the Yoruba cultural influence spread across the Atlantic to the Americas. European slave hunters violently captured and marched untold millions of Africans to their demise on over crowded slave ships bound for the Americas. Slave wars launched by the kingdom of Dahomey against some of the Yoruba kingdoms, and slave wars between the Yoruba’s themselves made war casualty Africans available for transportation to the Americas. Yoruba slaves were sent to British, French, Spanish and Portuguese colonies in the New World, and in a number of these places Yourba traditions survived strongly. In Brazil, Cuba, Haiti, and Trinidad, Yoruba religious rites, beliefs, music and myths is evident even at this late day. In Haiti the Yoruba’s were generally called Anagos. Afro-Haitian religious activities give Yoruba rites and beliefs an honored place, and the pantheon includes numerous deities of Yoruba origin. In Brazil, Yoruba religious activities are called Anago or Shango, and in Cuba they are designated Lucumi. Slavery in the United States was quite different from other colonized regions. In the U.S. chattel type slavery was the means where the language and culture was whipped and beat out of the African captives. In the U.S. throughout the Diaspora, the African generally received the death penalty for practicing his or her birthright. Today the religion has undergone a phenomenal surge in popularity and interest. Santeria, the adaptation of Yoruba and Ifa with Catholicism, came to the states first with Puerto Ricans in the forties and fifties and then with the flood of Cuban refugees in the sixties. In all of these places mentioned above, the pantheon of major Yoruba deities has survived virtually intact, along with a complex of rites, beliefs, music, dances and myths of Yoruba origin. In resent years, availability of attainable air travel has enabled African Americans to go back to the essence from which this great culture derived (Africa) and gather the information needed to teach and assist others. Places like Oyotunji village in Beaufort South Carolina, DOYA (Descendants of the Yoruba in America) foundation in Cleveland OH, Ile Ori Ifa Temple in Atlanta GA, and African Paridise in Grffin GA where Yoruba culture and religion is still practiced, are just a few of many locations that offer a place to reclaim the religion of self awarness, inner strength, inner peace and unlimited power for our evolution.